Composite, or tooth-colored, fillings are fillings made from a composite resin that are used to repair decayed and damaged teeth. Once decayed tissue is removed, composite resin fills the remaining cavity and can also be used to fill cracks or fractures. Because the composite resin is white or tooth-colored, the filling will blend in with the rest of your tooth, giving your smile a natural appearance. Composite resin is manufactured from a plastic resin, but can also consist of glass, porcelain, or quartz to give it a more natural appearance. You may need a composite filling if you have small to medium areas of tooth decay or damage that needs to be removed and you are looking for a cosmetic dental filling option. Additionally, you may need a composite filling if you are currently have metal allergies and cannot use silver amalgam fillings. To find out if composite fillings are right for you, schedule a consultation with Drs. Chris and Kristie Vinson of Tulsa Precision Dental today! 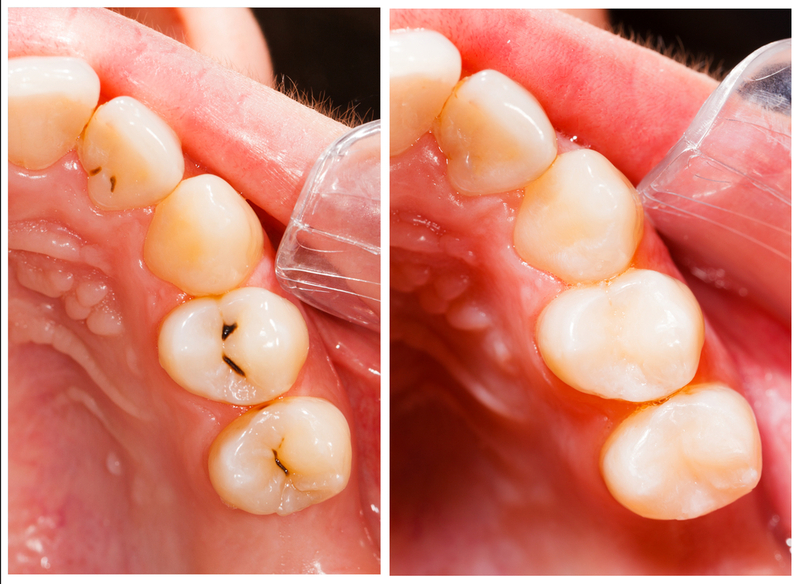 What is the difference between a composite filling and an amalgam filling? Both composite fillings and amalgam fillings are types of dental fillings that can be used to fill in cavities. However, composite fillings are composed of a plastic resin that can blend in with the color of your natural teeth, providing a visually-appealing filling option while preserving more of your natural tooth structure. Conversely, amalgam fillings are composed of liquid mercury, and powdered tin, copper, and silver. Although amalgam fillings are stronger and longer lasting, they lack the aesthetics of composite fillings. Amalgam fillings are also prone to corrosion over time and some people may even be allergic to the metals used. What should I expect when having a composite filling placed at Tulsa Precision Dental? During your composite filling procedure, Drs. Chris and Kristie Vinson will anesthetize your mouth to keep you comfortable. They will also isolate the affected tooth to keep it dry during treatment. This is essential to ensure the filling is properly placed. Once your tooth has been numbed and isolated from the rest of your mouth, Drs. Chris and Kristie Vinson will gently remove the decayed parts of your teeth with a dental drill. After removing all the decayed tissue, the remaining cavity will be prepared for the placement of the composite filling by properly cleaning and disinfecting the cavity. Then, to place the composite filling, the composite resin will be applied, layer by layer, with each individual layer being hardened with a special curing light before placing the next layer. Once the final layer has been applied, the composite filling will be shaped and polished to match the rest of the tooth. On average the entire procedure time from start to finish takes about an hour. If the decay is deep, however, this will add time to the procedure. What should I expect after my composite filling is placed? Because your composite filling is completely hardened during the placement procedure, it is ready for immediate use. You will be able to return to your usual activities, such as school or work. Additionally, you will be able to eat and drink as soon as you can feel your mouth again and will have no dietary restrictions. After you have your composite filling is placed, you may undergo a brief period of tooth sensitivity. During this time, you may notice that your teeth hurt when exposed to hot, cold, or sugar. This is to be expected for a few days following your procedure and will usually fade on its own once your tooth has acclimated to the new filling. 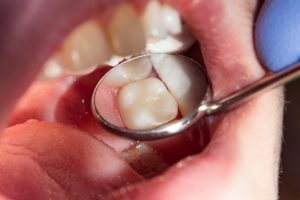 How do I care for my composite filling? Your composite filling is actually quite easy to care for and doesn’t require any additional care outside practicing good oral habits. 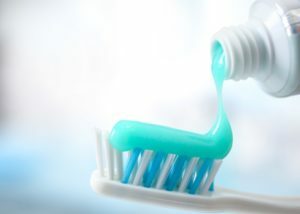 Good oral habits should include brushing your teeth for two minutes twice daily using a fluoridated toothpaste, flossing once daily, and visiting Tulsa Precision Dental twice a year for your dental checkup and professional teeth cleaning. Dental checkups are especially important when you have composite fillings because Drs. Chris and Kristie Vinson will check your composite fillings for any signs of damage or wear that may indicate a replacement is needed. Your composite filling has the potential to last an average of 5-7 years, depending on its location in your mouth, its size, and your oral habits. To keep your composite filling in good shape, be sure to practice good oral hygiene habits and avoid destructive behaviors. Examples of destructive behaviors include chewing ice, biting your nails, smoking, and using your teeth to open packages. If you start to experience sudden pain or tooth sensitivity, it may be an indication that your filling needs to be replaced. Our dentists will use a special probe to test the borders of your filling to determine if it is coming loose. Depending on how worn down the filling is and its location, it may be either repaired or replaced. If the filling is repaired, additional layers of composite will be added to secure the filling. This is usually the case when the composite filling is part of a molar. 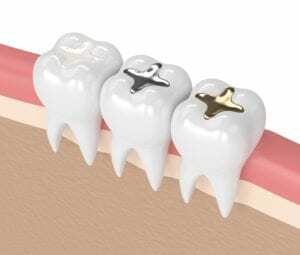 If the filling is replaced, then it will be completely removed and a new filling will be placed. Composite fillings can average about $135-$240 depending on where the filling is placed and how large the filling is. If you have dental insurance, you will likely be able to obtain some level of coverage to help with this cost. Tulsa Precision Dental will work with you and your dental insurance company to determine your level of coverage and remaining financial obligation before treatment. 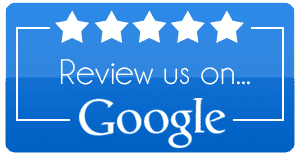 At Tulsa Precision Dental, your smile is our top priority. For a full range of dental services using the latest in dental technology, schedule a consultation with Tulsa, OK dentists Drs. Chris and Kristie Vinson today!